Ho ho ho, yes it’s me, Marc Hershon. Host and nerf herder for Epi161 of Succotash, the Comedy Soundcast Soundcast. This is a full-on Succotash Clips episode, with a couple of extra treats in store, as befits the holiday season. First up, gotta couple of like dates coming up. This very show has been invited to get onstage in the upcoming 17th Annual San Francisco Sketchfest once again. We’ll be at Piano Fight in the Tenderloin on Sunday, January 14th, at 5:30 PM. Our announcer, Bill Heywatt, will once again be live for this show and we’ll have some special guests. So special I don’t even know who they will be yet – gotta wait to see who’s hanging around from the Sketchfest as we get closer to the date. Admission is FREE but space is limited, so you can click here for your free tickets! Then a week later, at that same SF Sketchfest but at a different venue – the historic, magnificent Castro Theater - they will be doing a tribute screening of The Foot Fist Way, starring Danny McBride and directed by Jody Hill. It’s a hilarious low budget movie if you haven’t seen it, McBride’s first starring role – since he and Hill co-produced it, he had an in, you see. And both of those guys will be on hand and onstage for a live chat which I am honored to have been asked to moderate. That's on Sunday, January 21st, at 8 PM. So get over to SFSketchfest.com or, again, I’ve got the direct link to tickets right here. Also don’t forget that I’m working with Phil Leirness as the announcer on his less-than-a-year-old soundcast Los Angeles Breakfasts Club ON THE AIR. The December edition is up now and you can download ‘er from iTunes or from the homesite: http://LABreakfastClub.com. But now onto THIS show. Here’s the deal with this installment – the clips we’re playing were all pretty much harvested by our Associate Producer Tyson Saner for a show I was GOING to do back in October as a crossover episode with the guys from the Monster Party soundcast — Matt Weinhold, Larry Strothe, Shawn Sheridan and James Gonis. But Matt ended up having back surgery the week I was going to be in LA and we couldn’t pull the thing together. So before these clips start growing mold on them – or the digital equivalent – I figured we’d just do a Succotash Clips where we just play snippets from comedy soundcasts that are horror and sci-fi movie oriented. We’ve got The Sci-Fi Movie Podcast, CadaverCast, Comedy Film Nerds, the Universal Monster Cast and The Star Wars Minute. Plus I’ll throw in a clip from Monster Party just give my pals over there some guilt feelings. In addition there's a Burst O’ Durst segment with political comedian and social commentator Will Durst. PLUS a visit to the Studio P wet bar in a new Boozin’ with Bill where Mr. Heywatt is going to mix up an unsavory tribute to Washington D.C. called the Swamp Drainer! And, of course, this whole magilla is brought to you Henderson’s new Holiday Pants. Here’s a clip from the show responsible for this particular clip collection, Monster Party, and it's actually one of my favorite soundcasts. (You can tell because even with all the shows I have to listen to for THIS show AND my Splitsider.com reviews, I actually subscribe to this one!) This is from their latest drop, featuring a past guest to this show as their guest, and real life friend Rick Overton. The episode is entitled “Future Past” and looks at the future as depicted in films from the past. In this clip, the guys are going off about the way Star Trek thinks we might be going. 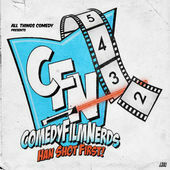 We love Comedy Film Nerds with Chris Mancini and Graham Elwood. In fact I just featured my chat with Chris from the recent Los Angeles Podcast Festival on our last episode. And while they don’t feature strictly sci-fi, monster, and horror movies on their show, they ARE pretty heavily into those genres. Back in their episode 384, the guys – along with guest Kevin Avery - get into a low budget crazy little movie called Dave Made A Maze, where they get into a little aside about none other than Rick Overton, who was just heard on the previous clip. Man, this show is getting’ meta! The next clip is from a very specific genre soundcast. 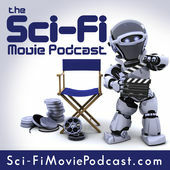 The show is called The Sci-Fi Movie Podcast (although at their homesite their logo says it’s The Sci-Fi Movie AND TV Podcast…), hosted by Remi Lavictoire and Jonathan Colbon, a couple of film geeks from Canada. This clip is from a recent episode where they were getting into War for The Planet of the Apes. They’ve been around for a few years, so you will no doubt find their show propagated throughout Soundcast Land. 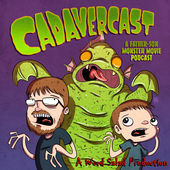 Next up is a clip from a show that Tyson says is “delightful” called Cadavercast, a Father-Son Monster Movie Podcast. The hosts are a Dad, Jef Burnham, and his 5-year-old son Alistair. And with a 5-year-old behind the mic, trust me when I saw a horror movie soundcast has never been more adorable.This clip is from their Epi30 where they get into one on of my all time faves, The 7th Voyage of Sinbad. Their homesite is actually just up on Soundcloud, and you can find the show on iTunes and other places you might expect to find soundcasts. There’s soundcast for specific movie genres, like monster movies, say. 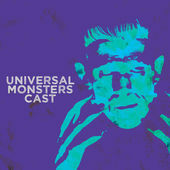 But then there are shows that get into sub-genres, too – such as the Universal Monsters Cast. First of all, I like that they just call it a “cast” instead of using the “P” word. Our associate producer really likes this show – says the hosts — Gillman Joel, Dr. Shock and Wolfman Josh — really stay on track with the discussion which, in this case, is all about The Mummy. In this clip, its about how Hammer Films treated the character, which came from the Universal corral of monsters. One of the best-known and longest-running sci-fi soundcasts around has got to be The Star Wars Minute. 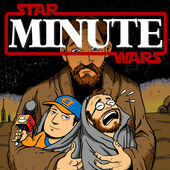 It set the bar for micro-genre casts, in that Pete the Retailer (aka Peter Bonavita) and Alex Robinson decided to break down Star Wars in the geekiest way imaginable – devoting each episode to ONE MINUTE of the movie, from beginning to end, including the closing credits. And they’re been working their way through the entire franchise. Currently blazing their way through Star Wars: Revenge of the Sith, they are up to minute 18 with guest commentator Chrysanthe Tan, a very talented musician/composer with, clearly, a streak of geek. 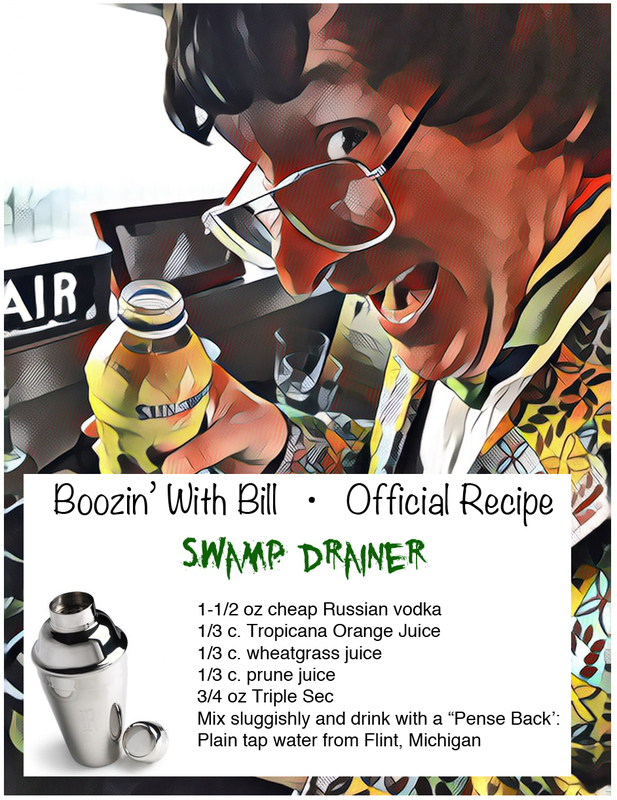 Here's Bill's latest recipe, Swamp Drainer, and after you try it you'll be asking yourself the same question I asked myself: Why? That's going to do it for Epi161 but before this clog ends, I have a question for you and, please, answer honestly: Have you been up to the podcast section of iTunes – that’s what they call soundcasts, of course — have you been up there to rate and review the Succotash Show? Of course you haven’t. No, wait. Yes, I do. But you can correct that easily enough by jumping up there right now to give us 5 stars and a short, pithy review. It really helps to get the word out there because our listing pops up higher in the pages and pages of soundcasts. If you’re in San Francisco during January don’t forget about our dates at SF Sketchfest and you can grab FREE tickets for the Sunday January 14th LIVE Succotash Show at 5:30 PM by clicking on the link up above. Hope to see you around. And, as always, thanks for passing the Succotash!